The age of Robotics has arrived. In fact, it’s been growing at a steady pace for quite some time. Most of us however, including many “strictly” IT professionals, are not aware of the advances and full implications for opening new markets, products and services and the technologies, skills and methods that will need to be learned and applied to be of any added value in this field. The technologies combined to make robotic systems are challenging the IT world. Electrical, Mechanical and Cognitive specialists will either supersede or need to be equalled and become bosom buddies with “robotics aware” IT professionals leading the AI aspects of robotics. IT programmers, analysts, designers, architects and testers (among others) and those capable of taking (or even better, of making) this transition will survive the robotic wave coming. Those that remain in the silos will be left to their own. Though robotic solutions today would surprise many, the near future robotic systems are those which (by our current standards) may sound more like a Ridley Scott science fiction film than a plausible future. Ten years ago however, the Mobile smart phone technology already existed as well. The early adaptors of robotics are already active and will have a considerable advantage in the future. In IT if you do not keep aware, you run the risk of becoming obsolete. IT for robotics is very real. And the designing, manufacturing and yes testing of the robotic systems, while in its infancy, is here to stay. The cliché of tin plated actors walking and talking as robots was farfetched, yet ironically there are fully autonomous robotic systems that make these Hollywood parodies look shameful in comparison. This took 50 years to realize from what was perceived to what was achieved. 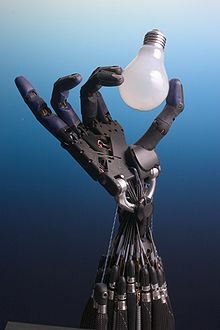 If we extrapolate, you can see we are close to major breakthroughs with lighter and stronger frameworks and smaller and more powerful computing and electrical technologies now making advanced robotics a realistic field. With the advances in mechanical, electrical and information technologies, this is no time to fall behind. The technologies will be more complex and the potential for discovering and eradicating defects and issues will become more urgent. Note: On January 12, 5PM CET, SogetiLabs will host its first public webinar with Daniël Maslyn as a moderator to further discuss the future of testing and robotics. Save the date and join by clicking on the following link: http://www.anymeeting.com/sogetilabswebinar (Limited to 200 attendees).